I find myself in an odd state of mourning. While out on a walk, I came upon the sawed up remains of a birch tree whose circumference was well over twelve inches in diameter. The log pieces were sawed up and placed haphazardly across a lawn very much the way a bed of carrots would like on your plate. This vision was a blow to what had been ingrained into me: that the birch tree was sacred, magical, and everlasting. At least, as a child of six years old, that is what I believed. I don’t remember very much about my primary schooling, but what I do remember are the visits to the museums. There, we studied aboriginal history and my imagination was taken over by the idea of the mysteries of the birch tree, birch bark canoes and birch-bark paper. My own parents planted birch trees in our yard, and tended to them well. I was taught to respect them, and for heaven’s sakes not to rip off the birch-bark paper because it would prove harmful to the tree. It was perhaps my first lesson in self-discipline, the first thousands I have encountered in my life. And so, with the scene of the dismembered birch comes yet another realization that something from childhood has been lost. There are times when one realizes that they’re at the threshold of an epoch in their life. And hopefully, when this happens, they have the presence of mind to realize it. Times like this do not happen often. But they do indeed happen. And you forget to breathe. That’s more or less what happened when I finally met David…. Mind you, I had to prepare myself in advance. It isn’t every day that one comes face to face with an iconic piece of art. And let me tell you, I haven’t met all that many which made this particular meeting rather spectacular. We found him at home in the Academia Galleria, a museum in Florence. Larger than life, perfect and glorious. I hung around the back of the crowd as the tour guide made his introduction of David to our tour group. Please understand, that by this time, Frank, Jen and I had seen several replicas of David. Most statues were found outdoors, looking miserable from being continually assaulted by the local pigeons. I had to ask several times …. And the heartbeat of all things rennaisance. 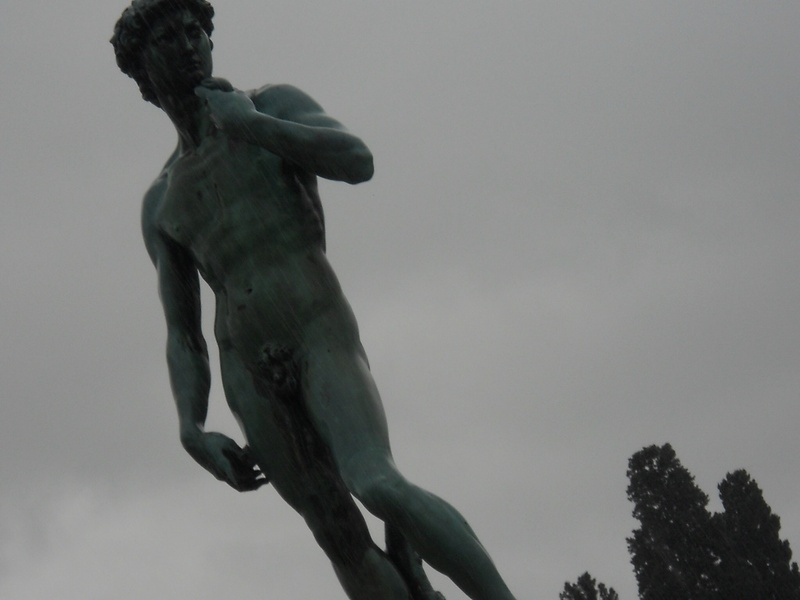 The tour guide assured that yes, this was the real David sculpted by Michelangelo. And so, what does one say when meeting the iconic statue of David? But if I had to say a few words I would have been too awestruck. Instead, I allowed myself to walk around the statue several times before taking a seat on the benches conveniently placed behind David…. What else does one do when sitting directly behind the statue of David? At some point when the tour guide was explaining to us the glory of David, he mentioned how several years ago a man took a sledge hammer to the statue and although he did no major damage, the impact of the sledgehammer did leave a scar. To be honest, I was hard pressed to find any telling mark of the vandalism. Which led me to notice that something seemed wonderfully out of place, but I could not put my finger on whatever was tickling me from the inside of my brain. It took longer than it should have for me to figure it out. Having already spent over a week in the eternal city, Jen, Frank, and I had been caught up in all that is Rome, namely the ruins. And to think that this was the very piece of marble that Michelangelo had crafted into a sculpture that could possibly out endure another 500 and possibly even one thousand years. And here I was feeling quite underdressed in a baggy black hoodie, casual black slacks while peering up at David from under a wooly cowl. First of all, I am so grateful for this opportunity to see you with my own eyes. You are more beautiful than I ever imagined. …that I found myself bereft of all reason.